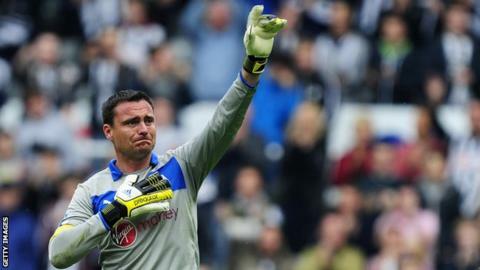 Former Newcastle United keeper Steve Harper has been appointed as Northern Ireland goalkeeping coach following Maik Taylor's departure from the role. Harper, 43, made 199 appearances for the Magpies between 1993 and 2013. The Durham man, who ended his playing career in 2016, is lead goalkeeping coach at Newcastle's Academy. "When I was offered the opportunity of joining the Northern Ireland coaching team I had no hesitation in saying yes," said Harper. Northern Ireland manager Michael O'Neill described Harper as an "excellent fit" for the job. "I believe both his experience and his knowledge of the game will prove invaluable for us going forward," added O'Neill, who played for Newcastle between 1985 and 1989. "With young goalkeepers like Bailey Peacock-Farrell and Conor Hazard in our squad, it is important that we have a coach who can help maximise potential." Harper, the longest-serving player in Newcastle's history, will combine the Northern Ireland role with his Newcastle job. "Michael and the players have achieved great things in recent years and I am really looking forward to working with the excellent group of goalkeepers in the squad," added Harper. Taylor stood down from the Northern Ireland backroom role earlier this month, saying that he wanted to pursue other opportunities in football. Harper gained his coaching badges in Irish FA-run courses.